Catalin Cimpanu @zdnet published yesterday an article “Popular Dark Web hosting provider got hacked, 6,500 sites down”. 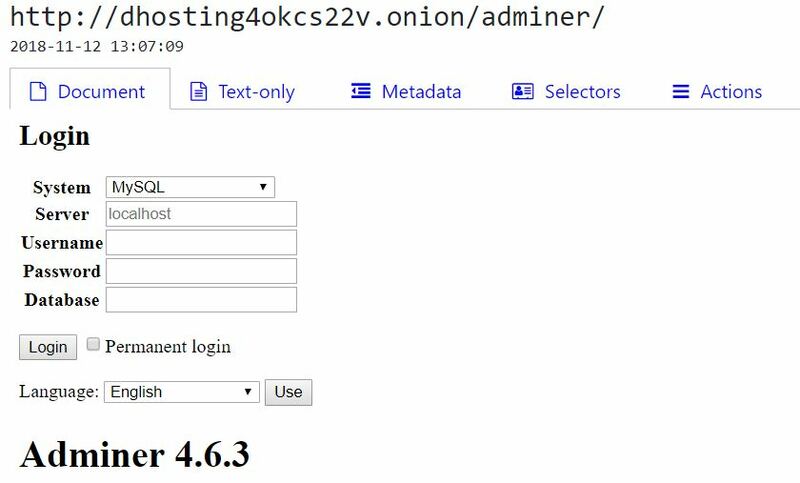 The hosting provider “dhosting4okcs22v.onion” was hacked on November 15, 2018 and all data was apparently deleted. The creator Daniel Winzen was cited: “Unfortunately, all data is lost and per design, there are no backups”, and that 6.500+ dark web services are affected. The first publicly accessible panel we found was “phpMyAdmin 4.6.6”. While an attacker still needs a valid username and password, this makes brute-force easily possible, especially via Tor where the source IP often changes and the attacker is anonymized. The phpMyAdmin should not have been publicly accessible via Tor, and even if, it should have had an additional protection like HTTP basic authentication and used a different installation folder than the easily guessable “/phpmyadmin”, which is part of every “directory buster” path list. The second panel found was “Adminer 4.6.3”. Depending on how the server was configured, this could have revealed the actual (non-Tor) IP address, if an attacker was using this tool to connect to their own server and watching the remote connection IP.